FINCA International’s BrightLife program has partnered with FIBR, an initiative of BFA and Mastercard Foundation, to leverage data analytics to build stronger linkages between BrightLife’s energy customers and FINCA Uganda’s financial services. This unique collaboration between an energy provider and a microfinance institution aims to chart a path to comprehensive financial inclusion for unbanked and under-banked Ugandans. Can Energy Access Serve as a Stepping Stone to Financial Services? 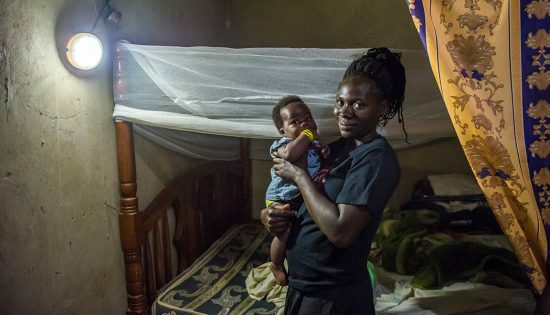 Most Ugandans still lack access to both reliable clean energy and essential financial services. This contributes to lower productivity, reduced economic growth and it perpetuates a vicious cycle of poverty. With this in mind, FINCA International launched BrightLife—a social enterprise in Uganda—that leverages FINCA’s low-income finance expertise, distribution capacity, and pay-as-you-go (PAYGo) technology to collaborate with best-in-class original equipment manufacturers (OEMs) to drive uptake of productive use appliances. BrightLife not only gets reliable clean energy into the hands of Ugandans, but also it serves as a stepping stone to the formal financial sector as most BrightLife customers, through PAYGo technology, are given access to loan capital for the first time. As BrightLife has grown in scale over the past four years, we have continued to grapple with what is next for our customers. With an introduction to loan products and a credit history established thanks to PAYGo, we envision a path to more impactful financial inclusion for our customers with full access to credit and savings. But this path has obstacles, both seen and unseen, and we are thrilled to have the team at FIBR partner with us to help navigate it. FIBR stands for Financial Inclusion on Business Runways and aims to learn how to transform emerging business data about low-income individuals and link them to inclusive financial services to deepen financial inclusion and its impact. FIBR is managed by BFA, a global consulting firm specialized in using finance to create solutions for low-income people, and supported by the Mastercard Foundation, one of the largest private foundations promoting financial inclusion worldwide. BrightLife and FINCA Uganda, a microfinance deposit-accepting institution, are partnering with FIBR’s team of data scientists, product managers, customer researchers, IT engineers and business modelers on several dimensions to strengthen the linkages between BrightLife and FINCA Uganda. Through BrightLife’s PAYGo technology, we are generating vast datasets on our customers regarding payment history. FIBR is helping us to establish the data analytics and visualization to turn this information into actionable insights. Further, they are collaborating with us to translate this knowledge into language that our microfinance operations understand—creating solutions that bridge the gap between PAYGo loans and traditional microfinance products. This data, with the help of FIBR’s IT specialists, needs to be linked to FINCA Uganda’s credit scoring and customer record systems so that the bank can properly integrate this new knowledge into their decision-making. But all of this isn’t enough. The financial products offered by FINCA Uganda must be designed with BrightLife customers in mind, and shifting a customer from a mobile-enabled, flexible PAYGo loan to a microfinance loan could prove challenging. For this, we are excited to work with FIBR’s customer research and product design teams to help us better understand the financial needs of our BrightLife customer base and co-create new financial products to be offered by FINCA Uganda. We hope for all of this to come together in a pilot for new financial products for BrightLife customers to help them “grow into” a full suite of financial services at FINCA Uganda. This will be a first-of-its-kind linkage in East Africa between a PAYGo energy provider and formal financial institution, creating a customer growth and exit strategy for BrightLife and a new customer acquisition channel for FINCA Uganda. The project between BrightLife, FINCA Uganda, and FIBR aims to demonstrate how millions of people could potentially benefit when social enterprises and financial institutions join forces. By working closely with BrightLife and FINCA Uganda, FIBR is helping us to transition successful BrightLife customers to more impactful financial inclusion. We are thrilled to be working with the FIBR team and leveraging their deep expertise in energy access, financial inclusion and technology. We could not imagine better co-architects and partners to design and build this first-of-its-kind bridge. For more information on the partnership between FIBR, BrightLife and FINCA Uganda, read “The Odd Couple: PAYGo Solar and Financial Service Providers” on Medium.